The CHRO is responsible for running an organization's human capital management and other HR technology systems. The rapid development and adoption of HR software, escalated competition for employee talent and increased government compliance requirements have elevated the importance of the HR function in companies, nonprofits and government agencies. In today's world, using traditional annual reviews to manage performance is as effective as relying on print newspapers to get breaking news. That’s why continuous performance management is so necessary. But what are some practical ways to shift from traditional reviews? 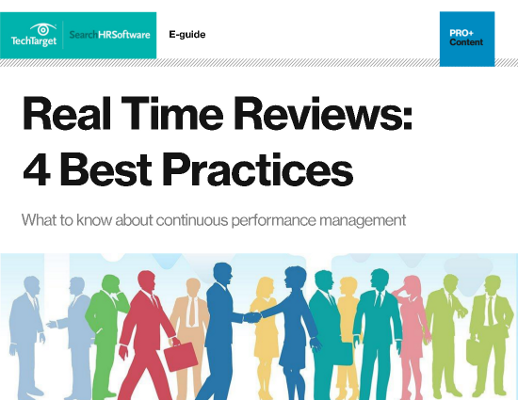 Here are 4 best practices to help you deliver more up-to-date, dynamic performance management techniques. In turn, organizations have widely begun to raise the formal management rank of their senior HR leader to a level equivalent to C-suite executives, such as the chief information officer (CIO), chief finance officer (CFO) and chief marketing officer (CMO), with more or less equal access to the chief executive officer (CEO). Sometimes, instead of CHRO, organizations use similar titles such as vice president of human resources or chief people officer. One of the CHRO's chief tasks is to design and carry out a talent strategy, which encompasses recruiting, hiring, developing and retaining employees. That process includes HR disciplines known as talent acquisition, talent management, employee training (using learning management systems) and succession planning. CHROs are usually involved with talent management software in larger enterprises. The chief human resources officer also commonly oversees an organization's benefits suite and software systems to administer insurance and retirement plans. Other responsibilities of the CHRO include managing employee recognition and wellness programs, employee perks and employee engagement, which is a popular management strategy -- increasingly reliant on specialized, mobile-optimized software -- that tries to make employees happier, more productive and less likely to leave the company. The CHRO may also oversee setting employee compensation rates and fostering positive employee experience and employee relations, including collective bargaining and handling grievances, complaints, and discipline. While there is no clearly defined career route for chief human resources officers, they should rise to leadership through positions in which they get experience and develop discipline in judging, coaching and recruiting people, according to the Harvard Business Review. Some business experts advocate that CHROs look for CEOs who see human capital resources as just as important as financial capital to the success of the organization and are looking for frank counsel on how the workforce should be structured. Additionally, some large enterprises hire and more quickly promote millennials in order to stimulate innovation, so aspiring CHROs may find that their career paths are becoming shorter and that they do not necessarily have to come out of traditional HR roles. CHROs should have experience in managing teams and budgets, and they should understand business analysis. In addition to HR expertise, they should be trained in ethical business practices and skilled in leadership, relationship management, communication and global and cultural awareness. Chief human resources officers should also be data and analytics driven and capable of using data about talent to assertively advise CEOs on strategic business decisions, including workforce management. Finally, CHROs are expected to be good business leaders and performance oriented, accepting responsibility for helping an organization's workforce contribute directly to the overall financial performance of the enterprise. How well integrated into the C-suite is your organization's chief human resources officer?